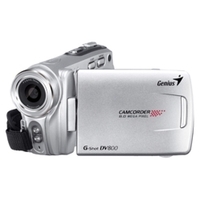 Genius G SHOT DV800, HD 720P Camcorder, 8 Megapixels photo function, 2.4" TFT Display, 16X Digital zoom, Flash/LED, AAA batteries	4.590,00 ден. 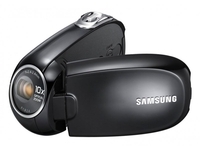 KAMERA Samsung SMX-C10 GP/EDC-grey	7.990,00 ден. 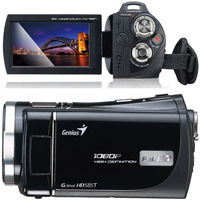 Genius G-Shot HD585T, FullHD 1080P Camcorder, 5 Megapixels photo function, 3” touch LCD panel, Flash/LED, 5x Optical zoom, HDMI, Lithium-ion battery	8.599,00 ден. 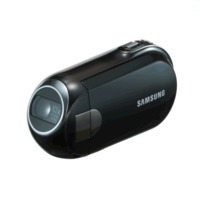 KAMERA Samsung SMX-C20 BP/EDC	9.490,00 ден. Aiptek FULL HD Video camera AHD Z7, FullHD 1920x1080, 10 Megapixels photo resolution with E.I.S., 5x Optical zoom, 3.0" LTPS LCD Display, Flash light for pictures, built-in stereo microphone and jack for external microphone, Face detection and tracki	9.990,00 ден. 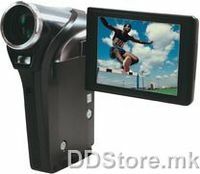 Sony DCR-SX15EB Camcorder	10.396,00 ден. KAMERA PANASONIC SDR-S 45 EP-S	12.219,00 ден. Canon FS-100,SD/SDHC camcorder,45x zum,megapixel CCD	12.442,00 ден.